Early Saturday morning saw a new firestorm of tweets from President Trump — a phenomenon that is becoming standard practice for the leader of the free world. However, the implications of this most recent outburst quickly set it apart. “I’d bet a good lawyer could make a great case out of the fact that President Obama was tapping my phones in October, just prior to Election!” the president tweeted at 3:52 a.m. He continued tweeting, calling Obama a “Bad (or Sick) guy!” and comparing the situation to the Watergate scandal. While this tirade took just over eight minutes, it has shaken up American politics. Pundits everywhere have had a field day projecting who might have known and when, and the White House called upon congressional oversight committees to investigate the alleged abuse of executive power. Let alone that the president does not have the authority to put in place a wiretap on an American citizen and that a judge would have had to issue a warrant, the Trump administration has produced no credible evidence to support its claim. But for President Trump, it seems that evidence and truth no longer matter. But the truth does matter. Of course it matters. So how can the president possibly get away with making these baseless claims? 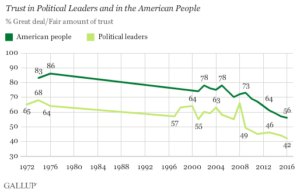 The answer is a growing lack of trust in the institutions that once defined American culture. The most obvious example is the media. Most recent Gallup polls suggest that only 32 percent of the country expects the “mass media” to “report the news fully, accurately and fairly,” a full eight percent decrease from the previous year. While this number is clearly low, it gets even more terrifying on the Republican side of the aisle. According to the same poll, 86 percent of Republicans show distrust in the media, and when asked who they trust more, Trump or the media, 78 percent of Republicans said they trust our president over the media to tell them the truth. These statistics suggest a deep divide in the country based on the responsibility and legitimacy of mass media to be fair and balanced. In the eyes of many Americans, the media has become too biased to trust, too biased to properly fact-check the statements of President Trump and too biased to accurately tell the story of what is happening in America. This is a dangerous concept indeed. Of course, politicians themselves are also often given a harsh light to stand under. Conspiracy theories, consistent candles and general mistrust for government have created an air of distrust in the representatives that we the people elect. This is the atmosphere in which President Trump ran his campaign, and it explains why his slogans of “LOCK HER UP”and “#draintheswamp” resonated with so much of his base. However, the biggest sense of distrust for the American people is not of politicians, it is not of the media, it is of other Americans. According to a poll from the PEW Research Center, 62 percent of highly engaged Republicans and 70 percent of highly engaged Democrats reported that the opposing party makes them afraid. Sixty percent of people who have a conversation with someone they disagree with find that they have less in common politically with the other person than they expected. While it is not new to fear ideas that are different from our own, the gap between the two parties is growing ever deeper and may never heal — especially if our president continues to play into it. He sets the tone for the country with the way he handles people, the way he handles situations and the rhetoric he chooses to use. What he says being factual matters; when he alleges that the murder rate is the highest its been in 40 years, that 122 people who were released by President Obama have returned to battle, that there was wiretapping orchestrated by the previous administration, or any of the other false claims the president has made on the campaign or in office, the gap widens. There is a trust vacuum in this country — a vast expanse of nothingness caused by years and years of blind partisanship — and by the time our country faces a real crisis, whether it be the impeachment of a president, an attack from North Korea, another financial crisis, the effects of global warming, or any of the other million things that could go wrong, the results will be devastating. We must bridge the gap. We must be prepared to come together as a nation and face whatever comes head on, with a steady hand, clear heads, and open hearts. So talk to your neighbors and see them as people, not a party. Do research about what is fact and what is not when consuming media. Be politically active and know who and what it is you are voting for. And be vigilant, because these trying times require nothing less.